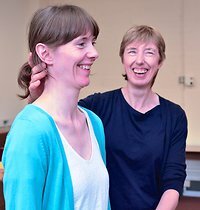 I'm Jenny Steele and I'm an Alexander Technique teacher practicing in Cheltenham. If you're reading this, the chances are you're wondering what the Alexander Technique may be about and indeed if it can help you. Maybe there's something you feel you should be able to achieve in life but somehow, you just can't seem to get there. Are you coming up against problems or restrictions that prevent you from enjoying whatever it is that you do in life? Everyday tasks seem more difficult than they should be, causing fatigue, pain, muscular stiffness, or simply a feeling of being stuck. Something seems to be holding you back, but somehow you can't work out exactly what's going wrong. Or perhaps you have a diagnosed medical condition and are looking to help yourself live more comfortably. Perhaps you’re a musician, an actor or enjoy sporting activities and want to improve your performance. Or maybe you’re recovering from injury or repetitive strain problems and would like to know more about how to find more ease and efficiency and learn how to help yourself prevent further problems. Alexander's work has been around for a long time - well over 100 years - and in that time has helped countless people change and improve their lives so they can work towards achieving their full potential. By learning to use the principles and tools of the Alexander Technique in your everyday activities, you can start to find more ease, more poise and better co-ordination. So that instead of experiencing discomfort and frustration, you begin to see more success and lasting improvement in the things you like to do in life. Young or old, no matter what your age, you can learn Alexander’s work if you choose to apply and work with the ideas. George Bernard Shaw was 86 when he started having lessons with Alexander! All you need is an open mind, a willingness to change. I'm a certified teacher of the Interactive Teaching Method for teaching the Alexander Technique. I am fully insured and work to a strict code of conduct. My main practice is located in Charlton Kings, Cheltenham just off the A40. It is easily accessible from Gloucester, Cirencester, Tewkesbury and the Cotswolds. Jenny Steele is an Alexander technique teacher based in Cheltenham. Click here for information on lessons, courses and workshops. is seeing how people change, how easily they change and how they enhance their sense of happiness and well being. I find that truly inspiring. It took me a while to acknowledge that. When practicing my horn one day, I realised I could play with considerably less effort and found myself thinking that, surely, it couldn’t be that easy! Well maybe it can.